In the 1300s, the Black Death sprang up in central Asia, and marched steadily over the Old World. As it claimed Europe from the south, people in the northern countries thought they might be safe from it. Then it came, in the form of a classic horror movie trope. We know of a few of the vectors that spread the Black Death through Europe in the 1340s. 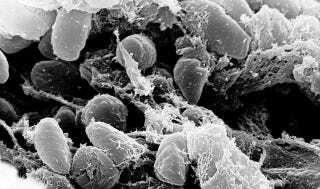 We know rats contributed to the spread of the disease, and we know fleas contributed to it. We sometimes forget that capitalism contributed to it, as well. The plague spread along trade routes, merchants doggedly marching to their destination as their fellows died around them. This is not an anti-capitalism screed. The trade routes spread many valuable things, and a few things — like knowledge — that were invaluable as well. Still, motivated interconnectedness has its drawbacks, as the people of Norway came to learn. It was the early 1340s when Genoese merchant ships brought the plague to Sicily, and news of the disease was the one thing that spread faster than the disease itself. Although no one had any idea how the Black Death spread, cities set up a few practical safeguards, including quarantines for incoming ships. Still, the disease claimed more territory and lives, but as it seemed to be making slow progress up through Europe, people in the northern countries could expect to wait some time for it to get to them. In the meantime, they could shore up their safeguards. But then infection hit them from an unexpected source. The plague came to England in the late 1340s. A trading nation, the English still put out ships, with the understanding that they would comply with quarantines. The trouble was, people have to be alive to obey quarantine. In 1349, a ship carrying wool set out from England, bound for some destination in the north. During its journey, crew members started dying. Attempts to quarantine the sick on board failed. The plague took one person after another, until every last crew member died. The disease itself lived on in the other creatures aboard. With some good luck, the ghost ship might have drifted on the sea until it sank, but the 14th century wasn't the century for good luck. The ship ran aground near Bergen harbor in Norway, where its living inhabitants — rats and fleas — made it into the country. Contemporary accounts, which do tend to be exaggerated, estimated that a third of the country died. From Norway, the plague spread Sweden and into Russia by 1351. So a ghost ship unleashed an unimaginable horror on the country it drifted into. Sometimes horror movies get history right. Image: Rocky Mountain Laboratories, NIAID, NIH.